The power requirements are one of the key limiting factors for implantable electronic devices as well as all portable and autonomous electronic systems. Although secondary power cells (e.g., lithium ion) can still be developed to improve on the existing state of the art, biofuel cells introduce a breakthrough concept as recharging can be theoretically achieved with virtually any available biomaterial. Biofuel cells can enable a permanent implantation without the need for surgical replacement, which clearly strengthens the community’s competence in this area. Recently, the possibility of developing implantable enzymatic biofuel cells (EBFCs) has come into focus since these devices would serve as a low-power source to miniature systems within the human body. EBFCs employ glucose as the substrate and oxygen or hydrogen peroxide as oxidizers, in which the power is gained by an oxidation of the biofuel at the anode (Figure 1). The enzymes involved in the process are usually glucose oxidase (GOx), horseradish peroxide (HPR), bilirubin oxidase (BOD), and laccase among the others (Willner et al., 1998; Pizzariello et al., 2002; Mano et al., 2003a,b). The human body is a storehouse of energy. An average person of 68 kg with 15% body fat stores energy approximately equivalent to 384540 kJ (Starner and Paradiso, 2004). However, the body has an abundant supply of energy from the food that we eat. For example, the power consumption of the brain is approximately 0.29 kcal/min (about 20 W) (Angel, 1990). Thus, if even a small fraction of this stored energy could be scavenged, an electronic device would have a large and renewable resource to draw on (Starner and Paradiso, 2004). This may be accomplished through the use of the energy stored within chemicals present in biological fluids, such as glucose (Barrière et al., 2004). Figure 1. Functionalized MWCNT-buckypaper-based biofuel cell operating in human serum from human male AB plasma. Bioelectrocatalytic reactions are based on the glucose oxidation by the PQQ-GDH and H202-reduction by laccase at anode and cathode, respectively. A variety of electron mediators can be used for the electrical contacting of the biocatalysts and the electrodes. The functionalization of the electrode surfaces with assembled monolayers of redox enzymes, electrocatalysts, and bioelectrozymes (i.e., genetically engineered biocatalysts) (Güven et al., 2010; Yu et al., 2011) can lead to very effective electrical contact (Willner et al., 1998). However, most of these systems would involve the use of diffusional mediators which are dissolved in their respective compartments, and this poses an additional problem for the devices that are intended to be used as power sources for implantable medical devices. Bioelectrocatalytic electrodes, providing efficient non-mediated electric wiring for immobilized enzymes, must be simple in fabrication and stable in electrochemical reaction. A physiological biofuel cell-powered device is in need of constant, reliable, long-term power provided by a body-based biofuel. First in vivo trials with fuel cells, implanted subcutaneously in right flank of adult dog, yielded a power density performance of 2 μW cm−2 (Drake et al., 1970) and in a rat (Wan and Tseung, 1974), which was generating 2.9 μW cm−2 of power for a time period of at least 4 h. Although, these earlier results were encouraging with respect to the electricity produced for low-power medical implants, preliminary studies were operated with abiotically catalyzed glucose rather than bioelectrocatalyst reactions. With the aim of developing an EBFC operating in vivo, researchers demonstrated power production from the hemolymph of snails (Halámková et al., 2012), “cyborg” lobsters (MacVittie et al., 2013), and serially connected clams (Szczupak et al., 2012). In addition, a biofuel cell was placed in an insect (Rasmussen et al., 2012). Although first animal experiments were not performed with mammals, studies demonstrated that EBFCs can produce electricity out of living organisms. Toward human implantable applications, the first demonstration of an implanted biofuel cell (fully biological), generating electricity inside a living organism and, in particular, implanted in a mammal, was in a rat (Cinquin et al., 2010). It was reported that the biofuel cell is able to generate electric power in a rat, using glucose and oxygen contained in its body fluids with an open circuit potential (OCP) of 0.275 V and maximum power output of 6.5 μW (Cinquin et al., 2010). Then, more sturdily constructed biofuel cell prototype was partially (anode compartment only) implanted in rabbit ear (Miyake et al., 2011), which was reflected in the maximum cell current (1.50 μA), whereas the power of this cell reached 0.42 μW at 0.56 V and in brain of a living rat with a maximum power of 2 μW cm−2 at a cell voltage of 0.4 V (Andoralov et al., 2013). Later, with the recent improvements in terms of carbon nanotube (CNT) compression and direct electron transfer, researchers were successful to increase the power (38.7 μW) obtained from the implanted biofuel cell in a rat, using a specially designed electronic circuit to charge a capacitor, to run a LED, or a digital thermometer (Zebda et al., 2013). Recently, researchers reported a glucose/oxygen biofuel cell using FAD-dependent glucose dehydrogenase enzyme at the anode side operating in human serum, which produces maximum power densities of 39.5 ± 1.3 and 57.5 ± 5.4 μW cm−2 for EFCs at 21 and 37°C, respectively (Milton et al., 2015). In our study, the strategy of direct electrochemical communication has been successfully applied with nanostructured buckypaper composed of multi-wall CNTs (Narváez Villarrubia et al., 2011; Strack et al., 2011; Halámková et al., 2012; MacVittie and Katz, 2014). Enzymes were immobilized onto buckypaper by using a heterobifunctional cross-linker, 1-pyrenebutanoic acid succinimidyl ester (PBSE), which provides covalent binding with amino groups of protein lysine residues through the formation of amide bonds and interacts with CNTs via π–π stacking of the polyaromatic pyrenyl moieties (Strack et al., 2011). PBSE results in a random orientation of the enzyme molecules relative to the electrode surface because of the large number of amino acid groups randomly positioned in the protein structure (Katz, 1994). In the case of a flat, robust electrode surface, direct electrode transfer would not be possible because active centers are buried inside the enzymes and therefore would be far away from the transducer surface (Katz, 1994). However, in the case of a buykypaper, electron access channels of the enzymes can find closer electron transport pathways regardless of the enzyme orientation, allowing efficient communication between the CNTs and the enzyme. Selection of the enzymes to immobilize on the buckypaper is also an important issue. In this study, pyrroloquinoline quinone-dependent glucose dehydrogenase (PQQ-GDH) was selected for the anodic bioelectrode because of the successful bioelectrocatalytic generation of anodic currents in the presence of glucose, when enzyme is tethered to CNT materials (Strack et al., 2013). Eventually, a dehydrogenase-based anode operating in the presence of oxygen did not require complex molecular ensemble to achieve a kinetically preferred electron transfer to the bioelectrode instead of oxygen (Katz et al., 1999). 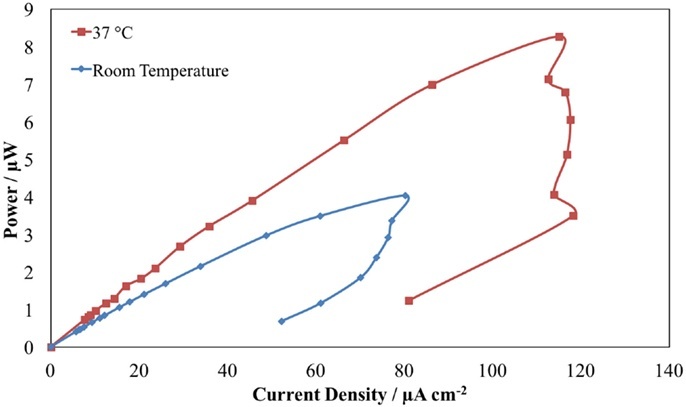 In order to perform potentially favorable biofuel cell operation based on glucose oxidation and oxygen reduction at the anode and cathode electrodes, respectively, oxygen-reducing laccase was selected for the cathodic reaction. Laccase is a well-known biocatalyst that is commonly used in EBFCs (Calabrese Barton et al., 2004), and it is compatible with the buckypaper electrode (Hussein et al., 2011). In this study, a model system is demonstrated for the biofuel cells that are operated in human serum. After the preliminary attempts to address the problems of integrated circuitries in a biofuel cell setup, with systems mimicking human physiology (Coman et al., 2010; Southcott et al., 2013), cyclic voltammetry and biofuel cell polarization that were applied for the characterization of the power generated from human serum is presented in this study. Pyrroloquinoline quinone-dependent glucose dehydrogenase (E.C. 1.1.5.2) from Microorganism (Toyobo Co., Japan) was used as supplied. Laccase (E.C. 1.10.3.2, from Trametes versicolor) was obtained from Sigma-Aldrich and used in experiments after the purification method as described elsewhere (Strack et al., 2011). Briefly, laccase was dissolved (5 mL, 20 mg mL−1) in potassium phosphate buffer (20 mM, pH 7.3) and dialyzed using a Slide-A-Lyzer dialysis cassette (10 kDa molecular weight cutoff; Thermo Fisher Scientific, Inc.) against a series of sequential buffer exchanges (10 mM potassium phosphate, pH 7.0 for 12 h at 4°C) containing 1 mM CuSO4, 1 mM EDTA, and buffer only. Following dialysis, the protein concentration of the preparation was determined using a bicinchoninic acid protein assay kit (Thermo Fisher Scientific, Inc.). Protein activity in respect to catalytic oxidation was determined for syringaldazine, using the supplier’s standard method (Sigma-Aldrich). The laccase preparation was normalized to a defined protein concentration (1.5 mg mL−1). Carbon nanotube-buckypaper prepared from 100% multi-walled CNTs (Buckeye Composites; NanoTechLabs, Yadkinville, NC, USA) was used as the electrode material (0.25 cm2 geometric area). Electrodes were incubated with 10 mM PBSE (AnaSpec Inc.) in DMSO with moderate shaking for 1 h at room temperature (RT) and subsequently rinsed in DMSO (5 min) to remove excess PBSE and then in potassium phosphate buffer (10 mM, pH 7.0; 5 min). The PBSE-functionalized electrodes were immediately incubated with enzyme solutions, for 1 h at RT with moderate shaking, before washing extensively with potassium phosphate buffer (10 mM, pH 7.0). Enzyme solutions consist of 1 mg mL−1 PQQ-GDH dissolved in potassium phosphate buffer (10 mM, pH 7.0) supplemented with 1 mM CaCl2 and 1.5 mg mL−1 of purified laccase for the modification of anode and cathode, respectively. The activity of PQQ-GDH and laccase immobilized on the anode and cathode were reported as 250 and 460 mU per electrode, respectively (Halámková et al., 2012), by performing optical assays as described elsewhere (Holwerda and Gray, 1975; Dewanti and Duine, 1998). The modified electrodes were used immediately or stored (4°C) in potassium phosphate electrolyte (0.1M, pH 7.0) until used in biofuel cell or electrochemical measurements. Enzyme (PQQ-GDH or laccase) and cross-linker (PBSE)-modified buckypaper electrodes were connected through a copper conductive tape (3M, SPI supplies) to a potentiostat (ECO Chemie Autolab PASTAT 10 electrochemical analyzer, using the GPES 4.9 software package) and used as the working electrode in electrochemical measurements where a Pt wire (Metrohm) and a Ag|AgCl|KCl 3M (Metrohm) were used as counter and reference electrodes, respectively. Cyclic voltammograms (CVs) were obtained in the potential range between 0 and 0.8 V (vs. Ag/AgCl) at a scan rate of 1 mV s−1. CVs of bioanode were tested in sterile-filtered human serum from human male AB plasma (Sigma-Aldrich, Product# H4522) supplemented with glucose (19.89 mM, final concentration) and a no glucose buffer solution (22 mM NaHCO3, 40 mg mL−1 BSA, 6.7 mM MgCl2, 5 mM KCl; pH 7.4) mimicking in vitro physiological conditions (Roach, 1963), whereas biocathode measurements were achieved in the absence and presence of oxygen (in equilibrium with air). Anaerobic conditions were achieved by purging the solution with nitrogen. The electrodes were modified for the biofuel cell measurements as it is explained above. 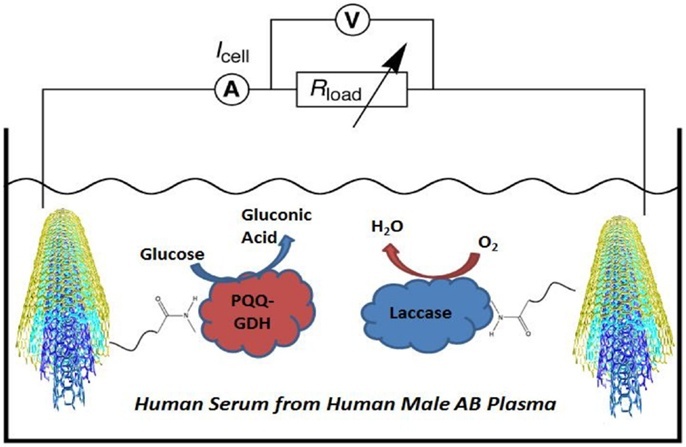 Biocatalytic electrodes were assembled in human serum solutions. Glucose concentration of the human serum used in this study is 4.89 mM (Ammam and Fransaer, 2010; Ammam and Easton, 2011). 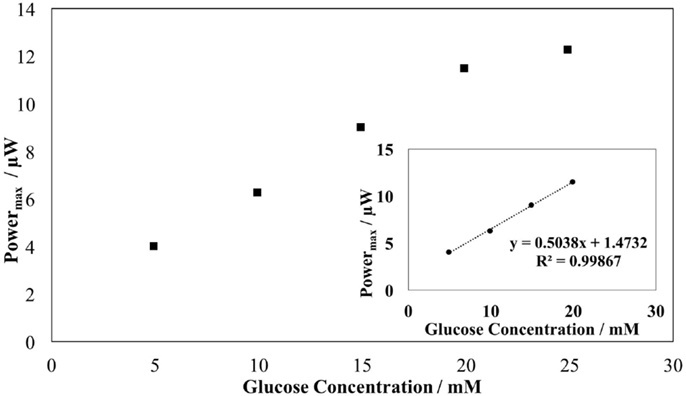 The effect of glucose concentration on power output was measured by adding d-glucose (from 4.89 to 24.89 mM, final concentration) into human serum solution. The voltage and current generated by the biofuel cell were measured by a digital multimeter (Meterman 37XR). For the determination of the power output, a variable resistance was used as an external load. The measurements were carried out at ambient temperature (23 ± 2°C). In order to evaluate the performance of the biofuel cell for in vivo use, it was tested in human serum at 37°C. The biofuel cell anode was characterized using CVs to validate whether the functionalized biocatalytic buckypaper electrodes (0.25 cm2) are capable of electron transfer to the electrodes. Peaks in the voltage–current curves would be observed at potentials corresponding to the potentials of the enzyme active centers, such as PQQ and T1 in GDH (Katz et al., 1999) and laccase (Calabrese Barton et al., 2004), respectively, in order to confirm the direct electrochemistry between the enzyme active center and electrode surface. 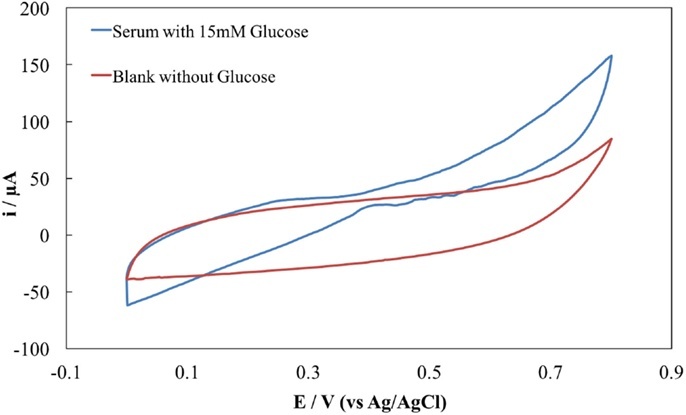 Cyclic voltammograms of the PQQ-GDH-modified electrodes were obtained in human serum supplemented with glucose (24.89 mM, final concentration) (Figure 2, blue curve) and in mimicking solution free of glucose (Figure 2, red curve). The anodic currents produced by PQQ-GDH (Figure 2) were observed only in the presence of glucose, which shows the successful immobilization of PQQ-GDH onto PBSE-functionalized CNT-buckypaper electrode. The anodic current produced by the oxidation reaction of the PQQ-GDH electrode was developed at around 0.10–0.15 V vs. Ag/AgCl. Previous works have reported that the anodic current produced by the PQQ-GDH electrode appeared at potentials more positive than −0.1 V vs. Ag/AgCl in a solution mimicking the physiological conditions (Halámková et al., 2012). The anodic voltage obtained in human serum approximately correspond the values demonstrated in buffer solutions for similar electrodes. Therefore, this result can be interpreted as the electrochemical activity of bioelectrodes. A positive correlation between the glucose concentration and bioelectrocatalytic current (data not shown) reveals the role of the glucose oxidation reaction as a significant source of electrons. The cathodic reaction of laccase-modified electrode is shown in Figure 3. 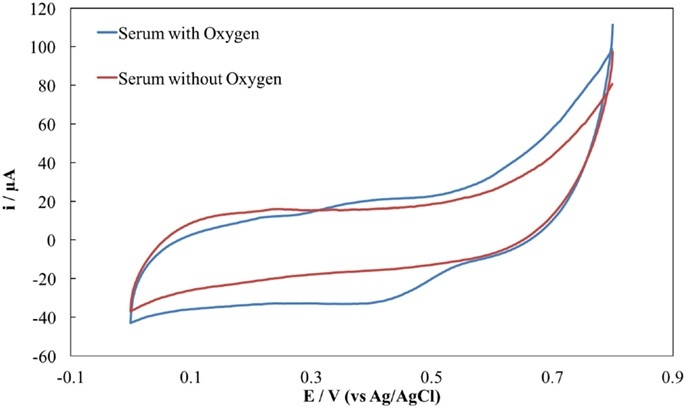 The presence of oxygen in human serum clearly resulted in the formation of bioelectrocatalytic currents (Figure 3, blue curve) where the oxygen reduction peak starts at around 0.50–0.55 V vs. Ag/AgCl. The appearance of the cathodic current obtained in human serum is similar to the previously reported currents appearing at ca. 0.58 V vs. Ag/AgCl in other related systems (Strack et al., 2011; Halámková et al., 2012). Figure 2. CVs of the PQQ-GDH anode in human serum supplemented with 20.89 mM glucose (blue) and glucose-free mimicking solution (red). Figure 3. CVs of laccase cathode in human serum in the presence (blue) and absence (red) of oxygen. The cell electromotive force (EMF) is the potential difference between the anode and the cathode or the voltage of the electrochemical cell. Theoretically, open circuit potential (OCP) should be the difference between anodic and cathodic potentials, i.e., EMF; however, in practice, the OCP is substantially lower than the theoretical value due to various potential losses, particularly activation/kinetic loss. The anodic and cathodic potential, obtained by the PQQ-GDH and laccase electrodes, were produced at 0.1 and 0.55 V vs. Ag/AgCl, respectively. Therefore, the OCP of ca. 0.45 V between the reactions at the anode and the cathode can be obtained. To evaluate the power generation, a decreasing resistance from 300 kΩ to 100 Ω at a time interval of 10 s in each load was applied, and the current and cell potentials for each resistance were measured. Later, the applied resistor, cell potential, and current were used to calculate power. Therefore, it can be said that power generated by biofuel cell was computed as a product of current passing through an external load and voltage drop across the resistor. The results of the different biofuel cell measurements operating in human serum and different additions of glucose concentrations are summarized in Table 1. The purpose of this experiment was to demonstrate the EBFC operation under different physiological conditions representing different glucose concentrations in human blood. With an attempt to demonstrate the biofuel cell in biomedical applications, human serum solution was spiked with various concentrations of glucose. Thus, final glucose concentrations between 4.89 and 24.89 mM were realized, corresponding to various physiological conditions (i.e., diabetes mellitus and health ranges) (Nelson et al., 2008). 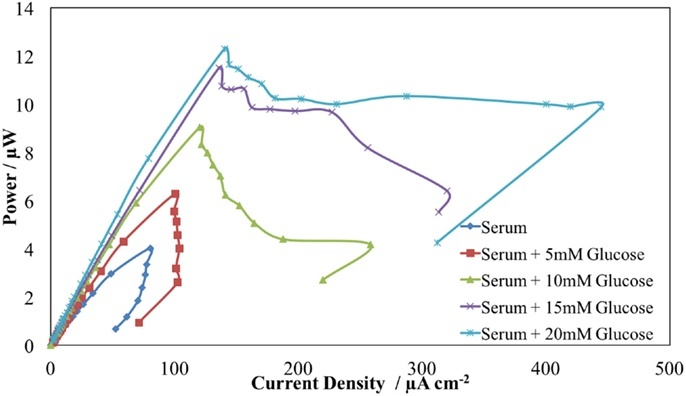 The biofuel cell operated in human serum showed an OCP value of 286 mV, and it was observed that upon an increase of the load resistance, the recorded power from human serum increased up to a maximum net value of 4.03 μW (power density of 16.12 μW cm−2) at an external load of 10 kΩ. The OCPs of the other human serum samples showed increasing values with increasing glucose concentrations as well as the power output, in which the maximum OCP and power density were 436 mV and 12.29 μW (power density of 49.16 μW cm−2), respectively. Table 1. Summary of the biofuel cell performance results obtained from different human serum samples. Figure 4. Cell voltage vs. current density curve of the biofuel cell operating in human serum and different glucose additions, at room temperature. Figure 5. The power output of the fuel cell operating in human serum and different glucose additions, at room temperature. The shapes of power curves for elevated sugar values in this model system were almost identical where the maximum power output was obtained with different glucose concentrations at the optimum external load of 10 kΩ. Since the variations at power generation represent the current/voltage dependence on the glucose (Castorena-Gonzalez et al., 2013), obtained net power has increased from 4.03 to 12.29 μW when the glucose levels were increased from 4.89 to 24.89 mM. However, linearity between the power output and glucose concentration was achieved between 4.89 and 19.89 mM (final concentrations) as the saturation level of the glucose concentration was reached for the biofuel cell operation. Figure 6 shows the maximum power generation by the biofuel cell as a function of the glucose concentration at the external load of 10 kΩ. The glucose-sensitive (0.50 μW/mM) biofuel cell is a redox pair of electrodes that generates power proportional to glucose concentration. Such a system can achieve simultaneous power transmission to implantable glucose sensors (Rai and Varadan, 2012) that measure real-time blood glucose as compared to conventional techniques involving drawing blood samples and in vitro processing. Figure 7. The power output of the fuel cell operating in human serum and different glucose additions, at room temperature. 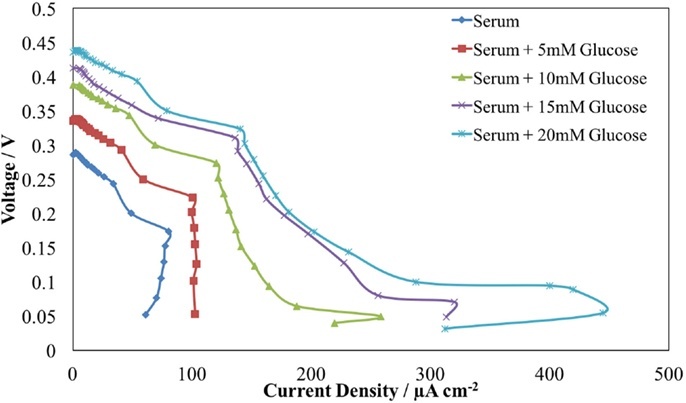 The temperature dependence of the biofuel cell operating in human serum at RT and at 37°C was examined without further optimization of the system. The power output showed sensitivity against temperature, and the power production has increased up to 8.27 μW at 37°C, which is almost twofold higher than it is recorded at RT (Figure 7). Moreover, not only similar power curve behavior was observed at 37°C but also with applying an external load of 10 kΩ, the biofuel cell produced electrical power demonstrated a relatively long period of stability (at least 3 h) at 37°C, with no medium replacement during the entire experiment. However, the problem about whether the enzymes remain stable for a long period of time is a concern. The efficiency of electron transfer between enzymes and electrodes should be improved. The enhancement on power output at human body temperature makes biofuel cell operating in human serum an attractive development prospect for use in future applications where power is needed for implantable medical devices. In this study, a model enzymatic fuel cell was developed CNT-buckypaper with PQQ-GDH on the anode for glucose oxidation and laccase on the cathode for oxygen reduction. The maximum OCP and power density were obtained as 0.44 V and 12.29 μW (power density of 49.16 μW cm−2), respectively. Additional studies for electrochemical characterization of enzyme-immobilized buckypaper electrodes have been achieved. Current studies are underway for further identification of the operational stability of the energy production process but what is undeniable is the proof of principle that human serum can be used as an energy source for biofuel cells. EY would like to thank EPSRC for the research fellowship (Life Science Interface EP/C535456/1) to support this work. SŞ would like to thank the Turkish Government for the financial support to his Ph.D. study at Newcastle University. Angel, A. (1990). Textbook of physiology. 21st edition. two volumes. edited by H. D. Patton, A. F. Fuchs, B. Hille, A. M. Scher and R. Steiner. vol. 1, pp. 769 (1–769); vol. 2, pp. 826 (771–1596). (Harcourt Brace Jovanovich, 1989.). Each volume £64.00 hardback. vol. 1 ISBN 0 7216 2523 1; vol. 2 ISBN 0 7216 2524 X; both vols 1 and 2 together ISBN 0 7216 1990 8. Exp. Physiol. 75, 281–281. Bockris, J.O’M., Srinivasan S. (1969). Fuel Cells: Fundamentals and Applications. New York, NY: McGraw-Hill Book Corporation. Drake, R. F., Kusserow, B. K., Messinger, S., and Matsuda, S. (1970). A tissue implantable fuel cell power supply. ASAIO J.16, 199–205. Menicucci, J., Beyenal, H., Marsili, E., Veluchamy, R. A., Demir, G., and Lewandowski, Z. (2006). Procedure for determining maximum sustainable power generated by microbial fuel cells. Environ. Sci. Technol. 40, 1062–1068. Nelson, D. L., Lehninger, A. L., and Cox, M. M. (2008). Lehninger Principles of Biochemistry. Macmillan. Roach, D. K. (1963). Analysis of the haemolymph of Arion ater L. (Gastropoda: Pulmonata). J. Exp. Biol. 40, 613–623. Starner, T., and Paradiso, J. (2004). “Human generated power for mobile electronics,” in Low Power Electronics Design (CRC Press), 1–35. Copyright: © 2016 Güven, Şahin, Güven and Yu. This is an open-access article distributed under the terms of the Creative Commons Attribution License (CC BY). The use, distribution or reproduction in other forums is permitted, provided the original author(s) or licensor are credited and that the original publication in this journal is cited, in accordance with accepted academic practice. No use, distribution or reproduction is permitted which does not comply with these terms.